As part of the essential Waitrose range, these large refuse sacks offer all the quality you’d expect at a price you wouldn’t. 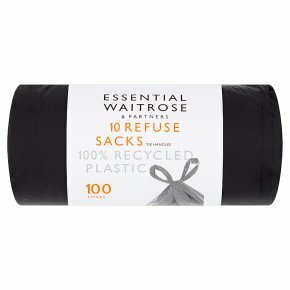 The roll is made up of 10 sacks made of 40% recycled plastic. Each sack has been designed to incorporate a handy tie handle, making them easy to seal after use. Warning: To avoid danger of suffocation keep these sacks away from babies, young children and pets.Allow hot refuse to cool fully before placing in the sack. Glass and sharp objects must be wrapped securely before placing in the sacks.